Feb. 20 (Bloomberg) -- Gold surpassed $1,000 an ounce in New York for the first time in almost a year as investors, hurt by plunging stocks and a deepening recession, sought to protect their wealth. Gold futures for April delivery rose $25.70, or 2.6 percent, to $1,002.20 an ounce on the New York Mercantile Exchange’s Comex division. Earlier the price touched $1,007.70, the highest since March 18. Gold, the only metal to advance in 2008, has rallied annually since 2000 and is up 13 percent this year. Global stocks extended an eight-session slide, erasing 54 percent of their market value since the start of last year on concern that the economic slump may worsen and wipe out corporate earnings. Governments are lowering interest rates and spending trillions of dollars to combat the recession, spurring investors to buy bullion as a hedge against inflation. Demand has pushed gold holdings in exchange-traded funds to records. Gold last topped $1,000 in March as interest-rate cuts by the Federal Reserve propelled the dollar to an all-time low against the euro in July. The metal reached a record $1,033.90 on March 17 before retreating to as low as $681 by October. Analysts say the rally may continue as investors lose confidence in financial assets. Stocks and bonds have trailed gold this year. The Standard & Poor’s 500 Index of equities has declined 15 percent and the benchmark 10-year U.S. Treasury has returned 0.23 percent. The U.S. government has committed more than $9.7 trillion to resolve the economic crisis. Benchmark interest rates in Japan and the U.S. are near zero while the Bank of England has slashed its main lending rate to 1 percent, the lowest ever. “Given the zero interest-rate policy being pursued by central banks around the world, the incentive to hold national currency has been taken away,” said James Turk, founder of GoldMoney.com. The company had $548 million of gold and silver in storage for investors at the end of January. Gold above $1,000 may attract more investors seeking to take advantage of the longest streak of annual advances in the metal’s price in 60 years. Assets in some of the industry’s largest exchange-traded funds are at all-time highs. Holdings in ETF Securities Ltd.’s gold exchange-traded commodities rose to a record 7 million ounces as of Feb. 13. The SPDR Gold Trust, the biggest ETF backed by the metal, expanded to 1,029 metric tons yesterday. Investment demand for bullion, including coins and bars, almost tripled to 399 tons in the fourth quarter, as total demand climbed 26 percent to 1,036.5 tons, the London-based World Gold Council said on Feb. 18. Retail and professional investors will continue to seek gold’s stability, said Aram Shishmanian, the council’s chief executive officer. Silver futures for March delivery climbed 55.5 cents, or 4 percent, to $14.49 an ounce in New York. The metal has surged 28 percent this year, the best performance among the 26 contracts on the UBS Bloomberg Constant Maturity Commodity Index. The metal fell 24 percent in 2008. Investment in Barclays Plc’s IShares Silver Trust, the biggest ETF backed by silver, also rose to a record yesterday, topping 7,892.2 metric tons. The highest prices in a year may encourage some investors to sell for profit, analysts said. Still, investors are boosting bets that gold may not fall below $800, options trading shows. The most-active options on gold futures were contracts that give the right to sell the metal at $805 an ounce by April. Those contracts rose 10 percent to $2.20. They accounted for two-thirds of today’s 3,983 put trades, with about 84 percent of the contracts trading at the bid price, indicating that sellers initiated the transactions. “Investors selling out-of-the-money puts expiring in April think there’s a slim chance gold will decline back to $800 an ounce,” said Andrew Wilkinson, the senior market analyst at Greenwich, Connecticut-based Interactive Brokers Group Inc.
Gold’s all-time inflation adjusted record is $2,224 an ounce on Jan. 21, 1980, according to a calculator on the Web site of the Federal Reserve Bank of Minneapolis. “From an inflation-weighted basis, gold is still pretty cheap,” O’Neill of Logic Advisors said. Feb. 20 (Bloomberg) -- Crude oil fell below $39 a barrel, retreating from its largest gain in seven weeks, as global stock markets declined on concern the recession is deepening. Oil lost as much as 6.5 percent as the Dow Jones Industrial Average tumbled below its lowest close since 1997. Crude jumped 14 percent yesterday after a report showed an unexpected decrease in U.S. inventories last week. The March crude oil contract expired at the close of floor trading today. Crude oil for March delivery fell 54 cents, or 1.4 percent, to settle at $38.94 a barrel at 2:51 p.m. on the New York Mercantile Exchange. The futures rose 3.8 percent this week, the first weekly gain in the past four. Prices are down 13 percent this year. Yesterday, oil gained 14 percent to $39.48 a barrel. The more-active April contract fell 15 cents, or 0.4 percent, to $40.03 a barrel. “The gloom that cloaks the rest of the globe’s financial markets could not be ignored for long and is dragging down oil prices,” Michael Fitzpatrick, vice president for energy at MF Global Ltd. in New York, said in a report. The Standard & Poor’s 500 Index had its biggest weekly drop since November, and Japan’s Topix Index reached its worst level since 1984. The MSCI index of 23 developed countries fell 1.6 percent to 777.85, the ninth straight daily decline. U.S. stocks pared earlier losses after a report that the Treasury Department next week will release some details of its plan to rescue the financial system. Treasuries rallied, and gold topped $1,000 an ounce in New York for the first time in almost a year, as investors spooked by plunging stocks and a deepening recession sought to protect their wealth. Barclays Capital cut its forecast for the average 2009 Brent crude oil price to $60 a barrel from $71 a barrel because of the weakening global economic outlook. The bank expects world oil demand to drop 1.25 million barrels a day this year. “The start of sustainable price recovery may have to wait for a clearer bottoming of the economic cycle,” Barclays analysts led by Paul Horsnell said in a report yesterday. Brent crude oil for April settlement lost 10 cents to $41.89 a barrel on London’s ICE Futures Europe exchange. Fuel demand during the past four weeks averaged 20 million barrels a day, down 0.1 percent from the average over the same period last year, the Energy Department said yesterday. Gasoline consumption averaged 8.9 million barrels a day for the period, up 0.8 percent from a year earlier. U.S. motorists reduced driving by the most in 66 years in 2008, the Federal Highway Administration said yesterday in a report. Vehicle-miles traveled last year fell by 107.9 billion, or 3.6 percent. The driving report and yesterday’s Labor Department report showing the number of Americans collecting unemployment benefits broke a record for the fourth straight week “just shows there’s not going to be a quick change in the economy anytime soon, and there’s no support for the crude markets,” said Chris Dillman, an analyst with Tradition Energy in Stamford, Connecticut. Volume in electronic trading on the exchange was 404,693 contracts as of 3:04 p.m. in New York. Volume totaled 612,055 contracts yesterday, 17 percent higher than the average over the past three months. Open interest was 1.2 million contracts yesterday. The exchange has a one-business-day delay in reporting open interest and full volume data. Gasoline for March delivery fell 2.4 cents, or 2.2 percent, to $1.0746 a gallon on the Nymex. Heating oil for March delivery lost 0.78 cent, or 0.7 percent, to $1.1967 a gallon. Oil inventories dropped 138,000 barrels to 350.6 million barrels last week, the first decline this year, the Energy Department report showed. Analysts had forecast an increase of 3.2 million barrels, according to a Bloomberg News survey. U.S. supplies have risen 21 percent since September. Inventories at Cushing, Oklahoma, the delivery point for New York futures, have almost doubled since November. Stockpiles have climbed amid a situation known as contango, in which prices for oil to be delivered in future months are higher than for earlier ones. This allows buyers to profit from holding oil. Oil for delivery in April cost $1.09 a barrel more than for March delivery today, and crude for delivery in March 2010 was $12.08 a barrel more. Feb. 20 (Bloomberg) -- The dollar posted its biggest two- day drop against the euro since December as traders withdrew bets on the greenback. The U.S. dollar also slid versus the Swiss franc, the yen and the Australian currency as the sell-off versus the euro triggered preset orders. The dollar earlier increased as much as 0.9 percent versus the euro as Citigroup Inc. and Bank of America Corp. tumbled on speculation the U.S. government may take over the banks, encouraging demand for a haven. The dollar lost 1.3 percent to $1.2846 per euro at 4:26 p.m. in New York, from $1.2674 yesterday, when it decreased 1.1 percent. The two-day drop was the biggest since Dec. 17. The dollar touched $1.2513 on Feb. 18, the strongest since Nov. 21. Japan’s currency gained 1.1 percent to 93.16 per dollar from 94.20, declining yesterday beyond 94 for the first time since Jan. 7. The yen depreciated 0.2 percent to 119.63 per euro from 119.37. The ICE’s Dollar Index, which tracks the U.S. currency versus the euro, yen, pound, Canadian dollar, Swedish krona and Swiss franc, fell for a second day, dropping 1.1 percent to 86.488. It touched 88.254 on Feb. 18, the strongest level since Nov. 21, when it reached a 2 1/2-year high. The dollar appreciated earlier versus most of its major counterparts as a drop in global stocks encouraged investors to take refuge in the world’s reserve currency. The greenback erased its gains at about 11:45 a.m. New York time as traders took off bets. “Clearly the market was caught long on the dollar on the equity sell-off in financials,” said Steven Butler, director of foreign-exchange trading in Toronto at Scotia Capital, a unit of Canada’s third-largest bank. A long position is a bet an asset will appreciate. The dollar fell 1.8 percent to 1.1530 francs, erasing an earlier gain of 1.3 percent. The dollar lost 0.4 percent to 64.63 U.S. cents against the Aussie after rising 1.3 percent. Mexico’s peso dropped as much as 1.5 percent to 14.9855 versus the dollar, its weakest level ever, as the central bank cut the target rate by a quarter-percentage point to 7.50 percent. The median forecast of 24 economists surveyed by Bloomberg News was for a reduction to 7.25 percent. The yen recorded a fourth straight weekly decline versus the dollar, dropping 1.3 percent, and was down 1.2 percent versus the euro. The greenback was little changed against the single currency this week. Stocks declined today, with the MSCI World Index falling for a ninth day, retreating 1.6 percent, and the Standard & Poor’s 500 Index dropping 1.1 percent. Citigroup and Bank of America lost more than 16 percent. The global credit crisis poses a “serious challenge” to the financial system, European Central Bank President Jean- Claude Trichet said today in a speech in Paris. The bank may lower borrowing costs again at its next meeting on March 5, he said. Policy makers will reduce the 2 percent target by a half- percentage point, according to the median forecast of 30 economists surveyed by Bloomberg News. Europe’s manufacturing and service industries unexpectedly contracted at a record pace in February, an index based on a survey of purchasing managers by Markit Economics showed. A composite index of both industries fell to 36.2, a record low. The median forecast of 13 economists surveyed by Bloomberg News was for an increase to 38.5. The euro touched a three-month low against the dollar on Feb. 18 on concern financial turmoil in eastern Europe may slow growth in the countries that use the common currency. Europe’s currency dropped 1.7 percent a day earlier after Moody’s Investors Service said it may cut the ratings of several banks with units in eastern Europe. The euro is down 8 percent against the dollar this year. Germany’s Finance Ministry said today in an e-mail statement that it has “no doubts” about the cohesion of the region using the euro, while its member countries need to carry out “structural reforms” to improve competitiveness. A report in Germany’s Der Spiegel magazine saying the ministry is examining ways to bail out distressed countries “doesn’t correspond with the facts,” according to the statement. MUMBAI, Feb 20 (Reuters) - India soybean futures may rise on Friday tracking firm Malaysian palm oil prices, analysts said. At 9:44 a.m., benchmark May palm oil KPOc3 on the Bursa Malaysia Derivatives Exchange was up 0.91 percent at 1,877 ringgit a tonne. The March soybean contract NSBH9 on National Commodity and Derivatives Exchange ended at 2,227 rupees per 100 kg, up 1.32 percent in the previous session. FKLI February futures contract rebound another 3 points higher to close 895 as compare to previous trading session with total 4696 lots traded in the market. FKLI starts rebound during trading session due to regional and Dow Jones futures electronic trading. Technically, FKLI traded within uptrend price channel in the hourly chart after seems support above 50% Fibonacci retracement figure at 886.5 levels. We expect FKLI would trade higher in the coming trading session provided support levels at 886.5 and 880 were not violated. Traders were advise to hold long position in the coming trading session while be cautious around resistance levels at 903 and 913 regions. FCPO 3rd month May Futures contract fall marginally RM15 lower to close at RM1860 as compare to previous trading session with 13026 lots traded in the market. CPO was traded volatile during trading session as soybean oil and crude oil electronic trading surge up trading session. 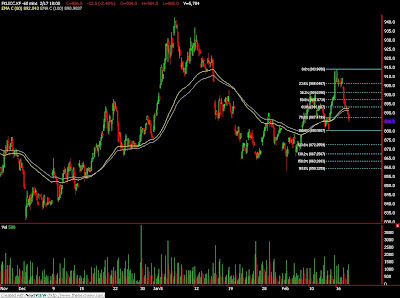 Technically, CPO price seem at support above RM1840; 50% Fibonacci retracement levels despite false break on RM1830 region twice during trading session. We expect CPO price would trade higher in the coming trading session provided support levels RM1840 and RM1810 regions. Traders were advice to hold long position around RM1850 and RM 1860 region in the coming trading session while be cautious around resistance levels around RM1900 and RM1930 regions. Feb. 19 (Bloomberg) -- Gold fell for the first time this week as demand eased after the price reached the highest since July. Silver also declined. Investment in the SPDR Gold Trust, the biggest exchange- traded fund backed by bullion, rose to a record 1,024.1 metric tons yesterday. The seven-day relative strength index for gold topped 70 for three straight days, signaling that prices may fall in the short term. Yesterday, the metal reached $988.70 an ounce, the highest since July 15. Gold futures for April delivery fell $1.70, or 0.2 percent, to $976.50 an ounce on the Comex division of the New York Mercantile Exchange. The price still is up 10 percent this year. Silver futures for March delivery slid 35.5 cents, or 2.5 percent, to $13.935 an ounce. The metal still has gained 23 percent this year. The SPDR Gold Trust is now the seventh-largest holder of gold, after the International Monetary Fund and the governments of the U.S., Germany, France, Italy and Switzerland. Switzerland has 1,040 tons of gold, according to the producer-funded World Gold Council. Funds in the SPDR Gold Trust have already increased by 243.9 tons this year, compared to 152.4 tons for all of 2008. Jewelry demand, which accounted for 58 percent of purchases in 2008, fell 11 percent to 2,137.5 tons, according to a gold council report released yesterday. Investment in all bullion ETFs last year rose 27 percent to 321.4 tons. 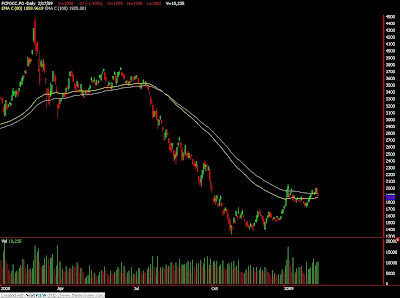 “Now that investment demand has displaced all jewelry demand and is accommodating heavy returning scrap, the only way that a further increase in investment can occur is if gold prices move higher,” UBS AG analyst John Reade said in a report today. Still, gold may continue to climb as investors seek an alternative to stocks and bonds, Kaplan said. The metal reached a record $1,033.90 on March 17. More than $27 trillion has been erased from the value of global equities in the past year as credit losses and writedowns reached $1.1 trillion. This year, the Standard & Poor’s 500 Index is down 14 percent, and the 10-year U.S. Treasury note has returned 1.2 percent. The metal has gained this year on speculation that government spending will trigger inflation. The U.S. has pledged more than $9.7 trillion to ease the recession and credit crisis. U.S. producer prices rose 0.8 percent in January, following a 1.9 percent in December, figures from the Labor Department showed today. The increase was the first in six months. Feb. 19 (Bloomberg) -- Crude oil rose 14 percent, the biggest gain in seven weeks, after a U.S. government report showed an unexpected drop in supplies as imports declined. Inventories fell 138,000 barrels to 350.6 million barrels last week, the first decline this year, the Energy Department said today in a weekly report. Stockpiles were forecast to increase by 3.2 million barrels, according to a Bloomberg News survey. The Organization of Petroleum Exporting Countries agreed to three supply cuts in 2008 to halt sliding prices. Crude oil for March delivery rose $4.86 to settle at $39.48 a barrel at 2:44 p.m. on the New York Mercantile Exchange. Prices are down 11 percent this year. The March contract expires tomorrow. The more-active April contract increased $2.77, or 7.4 percent, to end the session at $40.18 a barrel. Imports of crude oil declined 859,000 barrels a day to 8.79 million, the lowest level since September, when ports were shut in the aftermath of hurricanes Gustav and Ike, the report showed. Supplies at Cushing, Oklahoma, where New York-traded West Texas Intermediate crude is delivered, declined 52,000 barrels to 34.9 million barrels, the report showed. Inventories in the week ended Feb. 6 were the highest since at least April 2004, when the department began keeping records for the location. The price of oil for delivery in April is 70 cents a barrel higher than for March, down from a $2.79 premium yesterday. The spread between the first- and second-month contracts is the lowest since Nov. 20. December futures are $10.06 higher than the front-month contract, versus $12.11 yesterday. Volume in electronic trading on the exchange was 510,386 contracts as of 3:25 p.m. in New York. Volume totaled 507,765 contracts yesterday, 2.4 percent lower than the average over the past three months. Open interest was 1.22 million contracts yesterday. The exchange has a one-business-day delay in reporting open interest and full volume data. Gasoline inventories rose 1.11 million barrels to 218.7 million barrels, the Energy Department said. Stockpiles were forecast to fall by 500,000 barrels, according to the median of responses by 16 analysts in the Bloomberg News survey. Supplies of distillate fuel, a category that includes heating oil and diesel, dropped 813,000 barrels to 140.8 million, the department said. A 1.5 million-barrel decline was forecast. Fuel demand during the past four weeks averaged 20 million barrels a day, down 0.1 percent from the average over the same period last year, the report showed. Gasoline consumption averaged 8.9 million barrels a day over the past four weeks, up 0.8 percent from a year earlier. Gasoline futures for March delivery rose 3.34 cents, or 3.1 percent, to settle at $1.0986 a gallon in New York, the first gain in five days. Heating oil for March delivery increased 5.76 cents, or 5 percent, to end the session at $1.2045 a gallon. The average U.S. pump price for regular gasoline dropped 0.8 cent to $1.949 a gallon, AAA, the nation’s largest motorist organization, said on its Web site today. Prices have declined 53 percent from the record $4.114 a gallon reached on July 17. OPEC cut oil production by 3.5 percent in January, according to a Bloomberg News survey. Members with output quotas, all except Iraq, pumped 26.2 million barrels a day, 1.355 million more than their target of 24.845 million barrels a day. The group will load 22.8 million barrels a day in the month ending March 7, down from 23.5 million a day in the month ended Feb. 7, Oil Movements said in a report today. It’s the lowest volume since February 2004, according to the Halifax, England- based tanker tracker. Oil also climbed as the euro strengthened against the U.S. currency on speculation that Europe will take steps to address the financial crisis. Investors purchased commodities as a store of value. Europe’s currency rose as much as 1.8 percent to $1.276, its biggest intraday gain since Dec. 30. It touched $1.2513 yesterday, the lowest level since Nov. 21. Brent crude oil for April settlement increased $2.44, or 6.2 percent, to $41.99 a barrel on London’s ICE Futures Europe exchange. Futures touched $39.35 yesterday, the lowest this year. HAMBURG, Feb 17 (Reuters) - Palm oil stocks in key exporter Malaysia are likely to remain below last year's levels for most of 2009, oilseeds analysts Oil World forecast on Tuesday. But the higher palm oil prices generated by lower stocks could mean buyers seek alternative edible oils, it added. "We expect Malaysian palm oil stocks to remain below last year's level at least until September, but probably until December 2009," it said. "Malaysian production is likely to be curbed in calendar year 2009 by reduced yields." Palm oil prices have risen relative to other vegetable oils recently because of strong export demand partly due to the sharp decline in export supplies of soyoil, it said. "As a result, Malaysian palm oil stocks showed an unprecedented decline of 0.43 million tonnes from Dec 1 until end Jan 2009 to 1.8 million tonnes," it said. Feb. 18 (Bloomberg) -- OPEC may be called upon to boost output in early 2010 to meet oil demand after a decline in operating U.S. rigs causes production volumes to fall, according a Sanford C. Bernstein & Co. report today. Well shut-ins are “expected to grow markedly from March onward” as the cost of producing, transporting and paying taxes on the oil surpasses the price received for it, according to the analysts, led by Neil McMahon at Bernstein Research in London. U.S. rigs exploring for or producing oil have dropped by 38 percent since Nov. 7, according to Feb. 13 data published by Baker Hughes Inc. Oil rigs fell by 10, or 3.5 percent, last week to 273, the lowest since June 22, 2007. Oil prices have fallen 22 percent this year and 64 percent in the past year. During the last major oil-price decline in the late 1990s, the oil rig count dropped 77 percent over 24 months, the analysts said. That it’s down 38 percent in less than four months “suggests that volume shut-ins could occur more swiftly and steeply this time around.” Most affected will be oil production in Texas’s Permian Basin, California and the Midwest, they said. Crude oil for March delivery dropped 31 cents, or 0.9 percent, to settle at $34.62 a barrel at 2:46 p.m. on the New York Mercantile Exchange. The more-active April contract lost $1.13, or 2.9 percent, to $37.41 a barrel. March futures expire at the close of floor trading on Feb. 20. Futures fell on speculation that a government report tomorrow will show U.S. supplies climbed for the 19th time in 21 weeks as the recession cuts demand. Feb. 18 (Bloomberg) -- Soybeans fell to the lowest price in eight weeks on speculation that the slumping global economy will slash demand for food, livestock feed and biofuel. Corn was unchanged as farmers withheld supplies from last year’s crop. Former Federal Reserve Chairman Alan Greenspan said the U.S. may be doing too little to fix its financial system after President Barack Obama yesterday signed into law a $787 billion economic stimulus package. The Reuters/Jefferies CRB Index of 19 raw materials and the MSCI World Index of stocks declined. Soybeans are down 46 percent from a record in July, and corn has plunged 56 percent from an all-time high in June. Soybean futures for May delivery fell 18 cents, or 2 percent, to $8.865 a bushel on the Chicago Board of Trade, the sixth straight decline. Earlier, the price touched $8.845, the lowest for a most-active contract since Dec. 23. Soybeans reached a record $16.3675 on July 3. U.S. builders broke ground in January on the fewest houses on record as a lack of credit and plunging sales exacerbated the worst real-estate slump since the Great Depression, government data showed today. “It was the housing market that started this whole mess, and until it is fixed, economic conditions will be difficult to improve upon,” said Jim Gerlach, the president of A/C Trading in Fowler, Indiana. Soybeans also fell and corn erased earlier gains on speculation that demand for livestock feed will decline. Yesterday, hog futures plunged the most in almost a year after Smithfield Foods Inc., the world’s largest pork processor, said it plans to close six plants. Meatpackers processed 9.86 million hogs last month, 11 percent less than a year earlier, U.S. Department of Agriculture data show. The U.S. may produce 1.6 percent less pork in 2009 than in 2008, the agency estimated. Corn was unchanged after futures earlier fell to a nine-week low, encouraging farmers to withhold inventories of the grain harvested last year. The average U.S. cash corn price yesterday fell to the lowest since Dec. 11, data from the Minneapolis Grain Exchange show. The discount for cash corn in Iowa compared with Chicago futures fell to 6.55 cents a bushel from 39.3 cents on Jan. 2, signaling tighter stockpiles of grain available for producers of livestock feed and ethanol, USDA and exchange data show. Corn futures for March delivery were unchanged at $3.4925 a bushel in Chicago. The price touched $3.46, the lowest for a most-active contract since Dec. 12. Corn reached a record $7.9925 on June 27. Corn is the biggest U.S. crop, valued at $47.4 billion in 2008, followed by soybeans at $27.4 billion, government figures show. Feb. 18 (Bloomberg) -- Gold rose for a second straight day on speculation the recession will deepen, boosting the appeal of the precious metal as a haven asset. Silver also gained. Investment in the SPDR Gold Trust, the biggest exchange- traded fund backed by bullion, rose to a record 1,008.8 metric tons yesterday. Gold has gained 11 percent this year while the Reuters/Jefferies CRB Index of 19 commodities is down 12 percent and the Standard & Poor’s 500 Index has dropped 13 percent. Gold futures for April delivery climbed $10.70, or 1.1 percent, to $978.20 an ounce on the Comex division of the New York Mercantile Exchange. Earlier, the price reached $980.20, the highest since July 16. Gold gained 5.5 percent last year. Silver futures for March delivery rose 28 cents, or 2 percent, to $14.29 an ounce. The metal has gained 27 percent this year after dropping 24 percent in 2008. Gold demand surged 26 percent to 1,036.5 metric tons in the fourth quarter as the financial crisis spread, the World Gold Council said today in a quarterly report. President Barack Obama outlined a $75 billion plan to help as many as 5 million U.S. homeowners refinance mortgage loans. Yesterday, Obama signed a $787 billion U.S. stimulus bill, increasing the government’s commitments to $9.7 trillion to ease the recession and the banking crisis. Gold may rise above last year’s record of $1,033.90 on concern that government spending may spark inflation, said Tom Pawlicki, an analyst at MF Global Ltd. in Chicago. Still, gold’s gains were limited today after a rally to the highest price since July. The price earlier dropped to $961.60. The seven-day relative strength index for futures topped 70 yesterday, a signal that prices may fall in the near term, according to analysts. Feb. 18 (Bloomberg) -- Crude oil fell for a second day on speculation that a government report tomorrow will show U.S. supplies climbed for the 19th time in 21 weeks as the recession cuts demand. Stockpiles increased 3.2 million barrels last week, according to a Bloomberg News survey of analysts. A government report today showed that U.S. builders broke ground in January on the fewest houses on record, a sign that the recession in the world’s biggest energy-consuming country will deepen. Crude oil for March delivery fell 31 cents, or 0.9 percent, to settle at $34.62 a barrel at 2:46 p.m. on the New York Mercantile Exchange. Prices are down 22 percent this year. The more-active April contract dropped $1.13, or 2.9 percent, to end the session at $37.41 a barrel. March trading ends on Feb. 20. Brent crude oil for April settlement declined $1.48, or 3.6 percent, to $39.55 a barrel on London’s ICE Futures Europe exchange. It was the lowest settlement since Dec. 26. Housing starts plunged 17 percent last month to an annual rate of 466,000, lower than projected, according to figures today from the Commerce Department in Washington. A report from the Federal Reserve showed industrial output sank in January for the sixth time in seven months. Prices for delivery in future months are higher than for earlier ones, a situation known as contango, allowing buyers to profit from hoarding oil. This has led to record stockpiles at Cushing, Oklahoma, where New York-traded West Texas Intermediate crude is delivered. Futures touched $32.40 on Dec. 19, the lowest since February 2004, after a report showed that Cushing stockpiles climbed 21 percent the week ended Dec. 12. Gasoline supplies probably declined 500,000 barrels in the week ended Feb. 13, according to the median of 16 responses in the Bloomberg News survey. Stockpiles of distillate fuel, a category that includes heating oil and diesel, dropped 1.5 million barrels, the survey showed. The Energy Department is scheduled to release its weekly report tomorrow at 11 a.m. in Washington, a day later than usual because of the Presidents Day holiday. The industry-funded American Petroleum Institute said inventories rose 1.6 million barrels last week to 345.8 million barrels, in a report released at 4:30 p.m. in Washington. Gasoline futures for March delivery fell 4.66 cents, or 4.2 percent, to $1.0652 a gallon in New York, the lowest settlement since Dec. 31. The average U.S. pump price for regular gasoline dropped 0.3 cent to $1.957 a gallon, AAA, the nation’s largest motorist organization, said on its Web site today. Prices have declined 52 percent from the record $4.114 a gallon reached on July 17. Heating oil for March delivery declined 3.95 cents, or 3.3 percent, to end the session at $1.1469 a gallon, the lowest settlement since Aug. 31, 2004. U.S. fuel consumption dropped 3.1 percent to an average 19.5 million barrels in January, the lowest for the month in seven years, according to a report today from the API. “There won’t be any measurable or sustainable rally until we start to see demand recover or inventories drop because of the OPEC production cuts,” said Kyle Cooper, an analyst at IAF Advisors, an energy consultant in Houston. The Organization of Petroleum Exporting Countries cut oil production 3.5 percent in January, according to a Bloomberg News survey. Producers with output quotas, all members except Iraq, pumped 26.2 million barrels a day, 1.355 million more than their target of 24.845 million barrels a day. Volume in electronic trading on the exchange was 428,621 contracts as of 3:14 p.m. in New York. Volume totaled 568,788 contracts yesterday, 9.2 percent higher than the average over the past three months. Open interest was 1.23 million contracts yesterday. The exchange has a one-business-day delay in reporting open interest and full volume data. Feb. 19 (Bloomberg) -- The euro traded near a three-month low against the dollar before reports forecast by economists to show manufacturing and service industries in Europe contracted in February for a ninth month. The dollar rose above 93 yen for the first time in six weeks yesterday and strengthened to the highest against the euro since November after President Barack Obama pledged $275 billion to stem home foreclosures. The Polish zloty advanced from a near-record low, while the Czech koruna rose 2 percent, after tumbling on Feb. 17 when Moody’s Investors Service said it may cut the ratings of several banks with units in eastern Europe. The euro traded at $1.2543 per euro at 7:16 a.m. in Tokyo, after falling 0.4 percent yesterday when it touched $1.2513, the lowest level since Nov. 21. The dollar was 93.78 yen, after rising 1.5 percent yesterday. It reached 93.96 yesterday, the highest level since Jan. 7. The yen was at 117.65 per euro, following a 1.1 percent drop yesterday. Europe’s manufacturing and services industries probably shrank in February, according to economists surveyed by Bloomberg News. A gauge of services activity, based on survey of purchasing managers by Markit Economics, was probably at 42.5, compared with 42.2 in January. A reading below 50 indicates contraction. The manufacturing index likely rose to 35 from 34.4. A “breach” of the so-called support level of $1.2549 per euro would suggest the euro will drop to the $1.2388 level reached on Nov. 13, and possibly to $1.2329, the lowest since April 2006, Tom Fitzpatrick and Shyam Devani, technical analysts at Citigroup Inc. who use charts to predict currency moves, said in a research note to clients yesterday. Obama’s plan will create a new program to help as many as 5 million homeowners refinance conforming loans owned or guaranteed by Fannie Mae and Freddie Mac, according to information released by the White House. The Treasury Department will buy up to $200 billion of preferred stock in each of the housing companies, twice as much as previously pledged, the announcement said yesterday. The plan will entice Japanese investors to buy more securities issued by Fannie and Freddie, known as agency debts, pushing the dollar higher versus the yen, according to Stephen Gallo, head of market analysis at Schneider Foreign Exchange. Japan’s currency declined 2.8 percent to 10.72 versus the Swedish krona yesterday. Poland’s zloty gained 2.4 percent to 4.7731 per euro yesterday, after tumbling 5.5 percent in the previous two days. Poland sold some European Union grants on the market through the country’s state-owned Bank Gospodarstwa Krajowego to help the zloty, the Finance Ministry said in an e-mailed statement yesterday. The Czech koruna advanced 2.5 percent to 28.84 per euro after central bank Vice Governor Miroslav Singer signaled policy makers may raise interest rates to arrest the currency’s decline. The currency touched 29.68 on Feb. 17, the weakest since October 2005 as the Moody’s report fueled concern financial turmoil in eastern Europe will deepen. The Hungarian forint rose 2 percent to 303.22 per euro. The ICE’s Dollar Index, which tracks the greenback versus the euro, yen, pound, Canadian dollar, krona and Swiss franc, reached 88.254 yesterday, the highest level since Nov. 21 when it touched 88.463, the highest level since April 2006. The index gained 8 percent this year. Federal Reserve policy makers lowered their projections for economic growth this year, with most seeing a contraction of 0.5 percent to 1.3 percent, according to minutes of the Federal Open Market Committee meeting Jan. 27-28 released yesterday. The economy contracted last quarter at a 3.8 percent annual pace, the most since 1982. The Fed also introduced a long-term U.S. inflation estimate, with most officials aiming to anchor public expectations at a 2 percent rate. The yen weakened 0.7 percent against the dollar on Feb. 17 even after the Standard & Poor’s 500 Index lost 4.6 percent, on speculation the deterioration of Japanese economy may erode the currency’s status a safe haven. The government said on Feb. 15 that Japan’s economy shrank at an annual rate of 12.7 percent last quarter, the fastest rate since the 1974 oil shock. FKLI February futures contract rebound mildly 5.5 points higher to close 892 as compare to previous trading session with total 5658 lots traded in the market. FKLI rebound despite Dow Jones plunge during overnight trading. Technically, FKLI manage to build a base within 885 and 890 range before starts to surge up and hold above hourly 80 – day and 100 – day moving average. We expect FKLI would trade higher in the coming trading session provided support levels at 886.5 and 870 were not violated. 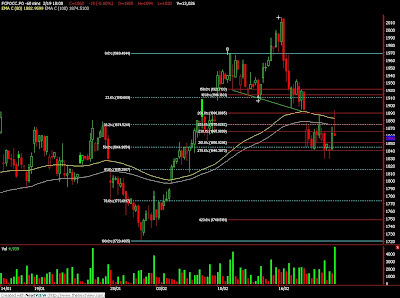 Traders were advice to hold long position while be cautious around resistance levels at 903 and 910. FCPO 3rd month April Futures contract fall RM20 lower to close at RM1875 as compare to previous trading session with 8105 lots traded in the market. CPO price plunge as soybean oil and crude oil closed weak during overnight trading session. 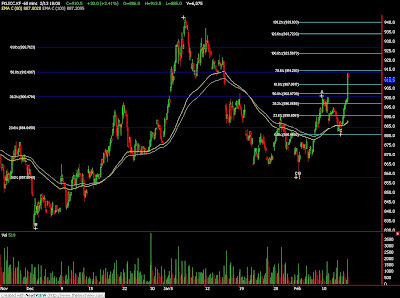 Technically, CPO price manage to hold against the selling pressure above 50% Fibonacci figure and RM1840 region which also 278.6% Fibonacci projection figures levels. We expect CPO price would trade higher in the coming trading session provided support levels at RM1840 and RM1810 were not violated. Traders were advice to hold long position in the coming trading session while be cautious around resistance levels at RM1900 and RM1930 regions. MUMBAI, Feb 18 (Reuters) - India soybean futures may fall on Wednesday tracking weak Malaysian palm oil and on improved weather conditions in Argentina, the world's third-largest producer of soybean, analysts said. At 9:32 a.m., the benchmark palm oil May contract KPOc3 on the Bursa Malaysia Derivatives Exchange was down 2.01 percent at 1,857 ringgit a tonne. Feb. 18 (Bloomberg) -- Crude oil traded below $35 a barrel after falling the most in three weeks yesterday on speculation a deepening recession in the U.S., Europe and Asia will cut fuel demand at a time of plentiful supply. Oil dropped as equities plunged on concern banks may face ratings downgrades and further losses as economies slow. Manufacturing in New York this month dipped to the lowest level since records began in 2001, the Federal Reserve Bank of New York’s general economic index showed. Crude oil for March delivery was trading 8 cents lower at $34.85 a barrel at 7:44 a.m. Singapore time on the New York Mercantile Exchange. In New York yesterday, futures fell $2.58, or 6.9 percent, to settle at $34.93 a barrel, the biggest decline since Jan. 27. Prices are down 22 percent this year. U.S. stocks tumbled to a three-month low, extending a global slump. The Standard & Poor’s 500 Index decreased 4.6 percent to 789.17, declining below 800 for the first time since November. Prices for oil to be delivered in future months are higher than for earlier ones, a situation known as contango, allowing buyers to profit from hoarding oil. The price of oil for delivery in April is $3.61 a barrel higher than for March. December futures are up $13.87 from the front month. An Energy Department report on Feb. 19 will probably show that U.S. crude oil inventories rose 3.2 million barrels last week, according to the median of 11 analyst responses in a Bloomberg News survey. It would be the 19th gain in 21 weeks. Gasoline stockpiles probably declined 300,000 barrels in the week ended Feb. 13, the survey showed. Supplies of distillate fuel, a category that includes heating oil and diesel, probably dropped 1.5 million barrels. Gasoline futures for March delivery fell 9.45 cents, or 7.8 percent, to $1.1118 a gallon yesterday in New York, the lowest settlement since Jan. 27. The average U.S. pump price for regular gasoline dropped 0.5 cent to $1.96 a gallon, AAA, the nation’s largest motorist organization, said on its Web site yesterday. Prices have declined 52 percent from the record $4.114 a gallon reached on July 17. Heating oil for March delivery fell 11.36 cents, or 8.7 percent, to settle at $1.1864 a gallon, the lowest since Sept. 10, 2004. It was the biggest one-day drop since Dec. 24. The MSCI World Index decreased 4.1 percent to 796.77, extending its 2009 retreat to 13 percent. The gauge of 23 developed markets has dropped for six straight days. The recession is weighing on all commodity markets with the exception of precious metals. The Reuters/Jefferies CRB Index of 19 prices dropped for the sixth straight day, the longest slump since December. The index touched 203.25, the lowest since June 21, 2002, and has slipped 11 percent this year. The Organization of Petroleum Exporting Countries, the U.S. Energy Department and International Energy Agency cut their demand forecasts this month because of the economic contraction. OPEC, supplier of more than 40 percent of the world’s oil, may cut production at a March 15 meeting if prices and markets are unstable, Iraqi Oil Minister Hussain al-Shahristani said. “If demand is going to stay down as it has done, then obviously we will need to cut production,” he said at a conference in Doha, Qatar, today. The 12-member group cut oil production 3.5 percent in January, according to a Bloomberg News survey. Producers with output quotas, all members except Iraq, pumped 26.2 million barrels a day, 1.355 million more than their target of 24.845 million barrels a day. Brent crude oil for April settlement declined $2.25, or 5.2 percent, to end the session at $41.03 a barrel on London’s ICE Futures Europe exchange, the lowest since Dec. 30. Volume in electronic trading on the exchange was 471,632 contracts as of 3:20 p.m. yesterday in New York. Volume totaled 697,606 contracts Feb. 13, 34 percent higher than the average over the past three months. Open interest on that date was 1.26 million contracts. The exchange has a one-business-day delay in reporting open interest and full volume data. Feb. 17 (Bloomberg) -- Gold jumped to more than $975 an ounce, the highest price since July, on speculation that low interest rates and government spending will devalue currencies, boosting the appeal of precious metals as a store of value. Silver and platinum also rose. Gold priced in euros and pounds reached records today as equities worldwide slumped on concern that the global recession may deepen. Investment in the SPDR Gold Trust, the biggest exchange-traded fund backed by bullion, rose 14 percent last week to a record 985.9 metric tons. Gold is up 9.4 percent this year. Gold futures for April delivery gained $25.30, or 2.7 percent, to $967.50 an ounce on the Comex division of the New York Mercantile Exchange. Earlier, the price reached $975.40, the highest since July 22. Floor trading was closed in New York yesterday for a U.S. holiday. Benchmark interest rates in the U.S. and Japan are near zero. The Bank of England slashed its rate to 1 percent this month, the lowest ever. President Barack Obama is set to sign into law a $787 billion U.S. stimulus bill, increasing the government’s commitments to $9.7 trillion to ease the recession and the banking crisis. Eastern European bank shares tumbled to six-year lows and stocks in Europe, Asia and the U.S. fell on concern banks may face rating downgrades and further losses. Banks worldwide have posted almost $1.1 trillion in writedowns and credit losses since the second quarter of 2007, when the U.S. subprime-mortgage market collapsed. Russia’s central bank raised gold’s share in reserves, and plans to continue this trend in 2009, Reuters reported yesterday, citing Alexei Ulyukayev, the bank’s first deputy chairman. “Gold has become, for all intents, the world’s second reserve currency,” Dennis Gartman, an economist and the editor of the Gartman Letter in Suffolk, Virginia, said today in a Bloomberg Television interview. Gold rose 5.5 percent last year, the eighth-straight annual increase, while the Reuters/Jefferies CRB Index of 19 commodities fell 36 percent and the Standard & Poor’s 500 Index plunged 38 percent. The S&P dropped as much as 4.5 percent today and the CRB Index fell as much as 3.9 percent. “Everyone is looking for a safe haven, and gold is the safest and most-liquid haven of them all,” said James Turk, founder of GoldMoney.com, which had $548 million of gold, silver and currency in storage for investors at the end of January. Gold’s price reached a record $1,033.90 an ounce on March 17 in New York and ended last year down 14 percent from that mark as falling asset prices forced investors to sell the metal to cover losses in other markets. Gold may sustain gains above $1,000, said UBS AG metals strategist John Reade. The bank on Feb. 4 said gold will average $1,000 this year, up from an October forecast of $700. “If the recent interest in gold has the characteristics of a mania, then it is an early-stage mania, we believe, based on the potential for additional investment,” Reade said yesterday in a report. Silver futures for March delivery rose 38.5 cents, or 2.8 percent, to $14.01 an ounce in New York. Silver fell 24 percent in 2008 and is up 24 percent this year. Platinum futures for April delivery climbed $37.30, or 3.5 percent, to $1,098.30 on Nymex. Platinum, which plunged 38 percent in 2008, has surged 17 percent this year. Palladium futures for March delivery rose $1.40, or 0.6 percent, to $217.90 an ounce. Palladium dropped 50 percent in 2008 and has gained 15 percent this year. FKLI December contract plunge another 22.5 points lower to close at 886.5 as compare with previous trading session with a total of 5784 lots traded in the market. FKLI was traded lower during the trading session followed regional and overseas indices. 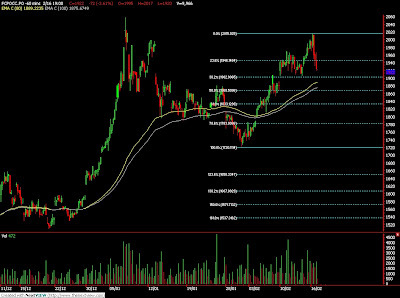 Technically, FKLI breached all the major support in the hourly chart and finally rested on 78.6% Fibonacci figures at 887.5 regions. 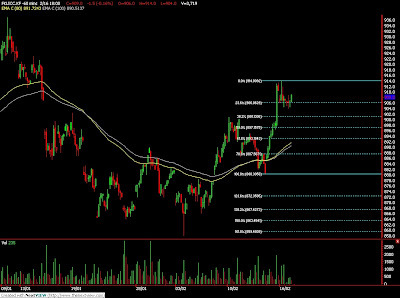 Based on the hourly chart, support at 887 and 870 are the final resorts in order for short term rebound to sustain. Failure to hold above this level shall indicated further selling pressure as bear trend continuous ahead. 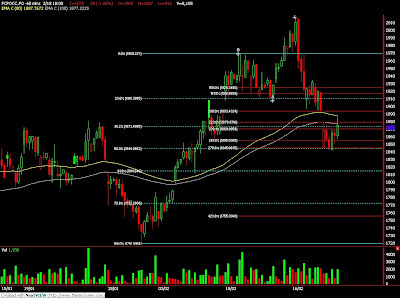 Traders were advice to hold short position only provided if support levels were violated. 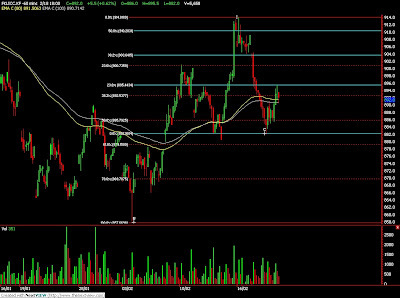 Resistances were seen at 890 and 900 regions. FCPO February futures contract traded RM27 lower compare to previous trading session and close at RM1895 with a total 10325 lots traded in the market. 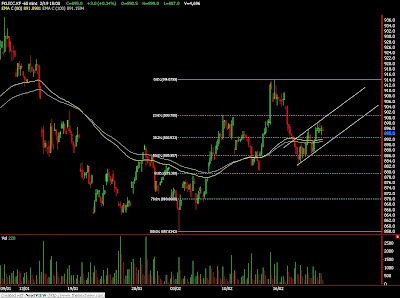 CPO price was mainly traded sideways throughout the entire trading session as lack of market leads towards directions. Technically, CPO price challenge the support trend line numerous times and finally rested on hourly 80 – days and 100 days moving average. 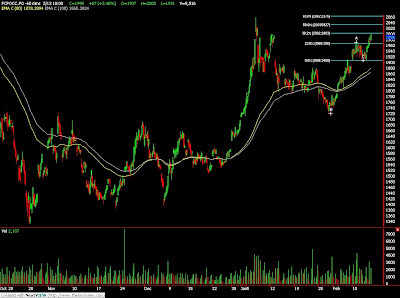 We expect CPO price would be well support above support levels at RM1870 and RM1840 regions. Traders were advice to hold long position in the coming trading session while be cautious around resistance levels at RM1940 and RM1980 regions. Feb. 17 (Bloomberg) -- The dollar may fall for a second day against the yen before U.S. housing and manufacturing reports economists estimate will show the recession is deepening. The pound may decline for a third day versus the yen on speculation a U.K. report will show inflation slowed amid an economic slump, giving the Bank of England room to cut interest rates. The euro may weaken for a second day against the dollar on concern about financial turmoil in central and eastern Europe. The dollar was little changed at 91.71 yen as of 8:57 a.m. in Tokyo from 91.73 yen late in New York yesterday. It traded at $1.2797 per euro from $1.2801. The euro was at 117.37 yen from 117.46, and declined to 89.51 British pence from 89.56 pence. Japan’s currency traded at 130.97 against the pound from 131.15 late in New York yesterday, and was at 79.06 versus the Swiss franc from 79.10. The Federal Reserve Bank of New York’s general economic index, fell to minus 23.75 in February from minus 22.2 the previous month, according to a Bloomberg News survey of economists. The National Association of Home Builders/Wells Fargo index of builder confidence remained at a record low of 8 in February from January, a separate Bloomberg survey shows. The figures will be released today. Benchmark interest rates are 3.25 percent in Australia and 3.50 percent in New Zealand, compared with 0.1 percent in Japan, encouraging investors to borrow in yen and buy higher-yielding assets elsewhere. In these so-called carry trades, investors get funds in a country with low borrowing costs and invest in one with higher rates. The risk is that market moves can erase those profits. The pound may weaken as the Office for National Statistics may say today that the U.K.’s consumer prices rose 2.7 percent in January from a year earlier, compared with 3.1 percent the previous month, another Bloomberg survey shows. The euro may fall amid growing concern that Ireland will default on its national debt. Credit-default swaps on the nation’s five-year sovereign debt jumped 49 basis points on Feb. 13 to a record 377 basis points, according to CMA Datavision prices. That’s 18 basis points more than Costa Rica’s. The rising cost of insuring against default by a “peripheral” European government “remains an important background negative for the euro,” Steven Pearson, a strategist in London at Merrill Lynch & Co., wrote in a note yesterday. MUMBAI, Feb 16 (Reuters) - Indian soyoil futures fell on Monday afternoon on sluggish spot demand and weakness in Malaysian palm oil. By 3:04 p.m. (0934 GMT), the March futures NSOH9 contract was down 0.88 percent at 446.75 rupees ($9.2) per 10 kg on the National Commodity and Derivatives Exchange. The February contract NSOG9, which expires on Feb. 20, fell 0.34 percent to 460 rupees. Spot prices of refined soyoil at Nagpur in the western state of Maharashtra, the country's second-largest producer, fell 0.7 percent to 445 rupees. "Imports of large quantity of edible oils in January is likely to pressurise the market," brokerage Karvy Comtrade Ltd said in a report. Data released by the Solvent Extractors' Association, a leading trade body, edible oil imports in January more than doubled to 856,690 tonnes from 457,601 tonnes last year. Weak Malaysian palm oil also weighed on the market. Feb. 16 (Bloomberg) -- Gold, little changed today in London, may advance as investors buy the metal to diversify portfolios and preserve their wealth as the global economy sags. The Group of Seven’s finance ministers said after talks in Rome yesterday that a “severe” economic downturn will persist for most of 2009. Japan’s economy shrank at an annual 12.7 percent pace last quarter, the most since 1974. Bullion for immediate delivery added $2.20, or 0.2 percent, to $943.90 an ounce at 5:25 p.m. local time. April futures climbed $2.20 to $944.40 in electronic trading on the Comex division of the New York Mercantile Exchange. The U.S. market is closed today for a holiday. The metal declined to $942.50 in the afternoon “fixing” in London, used by some mining companies to sell production, from $943 at the morning fixing. Bullion gained 3.3 percent last week and is up 7 percent this year. Gold may gain for a second straight week as the banking crisis and recession deepen, according to 26 of 32 traders, investors and analysts surveyed from Tokyo to Chicago last week. Five respondents advised selling and one was neutral. The U.K. economy will shrink 3.3 percent this year, almost twice the pace previously forecast, as the country heads into the worst recession in almost 30 years, the nation’s biggest business lobby said today. Assets in three of the industry’s largest exchange-traded funds are at all-time highs. ETF Securities Ltd.’s Physical Gold fund rose to 2.299 million ounces on Feb. 13. The SPDR Gold Trust, the biggest ETF backed by the metal, expanded to 985.86 metric tons as of Feb. 13, while Zuercher Kantonalbank’s fund has record assets of 3.734 million ounces. Gold reached a six-month high of $952.92 in London on Feb. 12. The metal may remain in a “consolidation phase” today because of the U.S. holiday and after last week’s gains, London- based broker Marex Financial Ltd. said in a report. U.S. Congress has given final approval to a $787 billion economic stimulus package and Treasury Secretary Timothy Geithner last week pledged as much as $2 trillion in financing for programs aimed at spurring new lending. Hedge-fund managers and other large speculators increased their net-long position by 5 percent in New York gold futures in the week ended Feb. 10, according to U.S. Commodity Futures Trading Commission data. Speculative long positions, or bets prices will rise, outnumbered short positions by 163,622 contracts on the Comex. Bullion has climbed 31 percent since October as governments are lowering interest rates and spending trillions of dollars to combat the recession. Among other metals for immediate delivery in London, silver slipped 0.7 percent to $13.59 an ounce. Platinum rose $2.25 to $1,066.50 an ounce, and palladium was 0.6 percent lower at $215.25 an ounce. Feb. 17 (Bloomberg) -- Crude oil traded near $37 a barrel in New York on speculation a deepening recession in Europe and Asia will stifle demand for energy and fuel. Brent crude, a benchmark for European, Africa and Russian grades, fell to a three-week low yesterday after U.K. bank stocks dropped and the Bank of England said the economy’s first quarter contraction may match last quarter’s 1.5 percent decline. Japan, the world’s third-largest oil consumer, yesterday said its economy contracted the most since 1974 in the fourth quarter. Crude oil for March delivery traded at $36.85 a barrel, down 68 cents from the Feb. 13 close, in electronic trading on the New York Mercantile Exchange at 10:38 a.m. in Sydney. Floor trading was closed for the Presidents’ Day holiday in the U.S. and yesterday’s transactions will be booked today for settlement. Brent crude for April settlement fell $1.53, or 3.4 percent, to $43.28 a barrel on London’s ICE Futures Europe exchange yesterday. It slumped as much as 3.7 percent as the U.K.’s FTSE 100 Index fell to a two-week low, led by Lloyds Bank Plc. The March Nymex oil contract expires on Feb. 20. The more actively traded April contract was at $41.50 today, down 47 cents from last week’s close. Japan’s gross domestic product contracted at an annual 12.7 percent pace in the fourth quarter of 2008, the Cabinet Office said yesterday. That followed a 13.9 percent drop in exports from the third quarter. The U.K. economy will probably contract 3.3 percent in 2009, up from the 1.7 percent decline predicted in November, the Confederation of British Industry said yesterday. The nation is headed for its worst recession in almost 30 years. World oil demand may not rebound until 2010, when it may begin rising by about 1 percent a year through 2013, International Energy Agency Executive Director Nobuo Tanaka said in London yesterday. Production cuts by the Organization of Petroleum Exporting Countries and cold weather are helping rebalance the oil market, bringing the low point for prices closer than previously expected, Goldman Sachs Group Inc. analysts said yesterday. “As a result, the bottoming in prices and time spreads could be closer than we originally expected,” Goldman analysts including Giovanni Serio and Jeffrey Currie said in a report. New York crude oil fell to $32.40 a barrel Dec. 19, the lowest for the near-month contract since February 2004. Feb. 16 (Bloomberg) -- The yen rose after finance ministers from the Group of Seven nations said the “severe” global slump will persist for most of 2009 and Japan’s economy shrank by the most since 1974, spurring investors to sell riskier assets. The yen snapped two days of losses against the dollar and the euro as G-7 officials avoided making any statement in support of efforts by Japan to weaken its currency. The pound fell versus the dollar after the Confederation of British Industry said the U.K. economy will contract at almost twice the pace previously forecast this year. The euro also dropped against the dollar. The yen dropped to 117.21 per euro as of 4:51 p.m. in New York from 118.37 on Feb. 13. The yen gained to 91.77 against the dollar, from 91.93. The dollar strengthened to $1.2770 per euro, from $1.2862. Japan’s currency may appreciate to 110 per euro in the next three months as the European economic outlook worsens, Hardman said. Japan’s own poor economy will drive currency to 100 versus the dollar by year-end, he said. The G-7 repeated its message that “excess volatility” and “disorderly movements” in exchange rates must be avoided. The group accounts for about two-thirds of the world economy and is composed of the U.S., Japan, Germany, U.K., Italy, Canada and France. Exchange-rate movements may be volatile today as a national holiday in the U.S. reduces trading volumes, said Masashi Kurabe, head of currency sales and trading at Bank of Tokyo-Mitsubishi in Hong Kong. Japan’s economy shrank 12.7 percent in the fourth quarter from a year earlier, the Cabinet Office said today. That’s the third consecutive quarter gross domestic product has contracted. The British pound fell against the dollar after the CBI, Britain’s biggest business lobby, said gross domestic product will shrink 3.3 percent this year, almost twice the 1.7 percent pace previously forecast. By the end of 2009, the economy will have contracted for six consecutive quarters, it said. “The dollar will benefit from renewed growth pessimism,” analysts led by Hans-Guenter Redeker, global head of currency strategy at BNP Paribas SA in London, wrote today. “Global economic weakness creates dollar demand via de-leverage and reversing cross border flows.” The dollar will rise to $1.22 per euro and 95 yen by the end of September, BNP Paribas said. The MSCI World Index dropped 0.7 percent and the Dow Jones STOXX 600 Index of European shares fell 1.2 percent. Japan’s current-account surplus makes the yen attractive to investors in times of turmoil, as it means the country doesn’t rely on overseas lenders. The pound was also hurt after the G-7 finance chiefs avoided any reference to the U.K. currency. The British currency dropped to $1.4267 from $1.4355. It rose to 89.49 pence per euro. The euro weakened amid growing concern Ireland may default on its national debt. Credit-default swaps on the nation’s five- year sovereign debt jumped 49 basis points on Feb. 13 to a record 377 basis points, according to CMA Datavision prices. That’s 18 basis points more than Costa Rica’s. The rising cost of insuring against default by a “peripheral” European government “remains an important background negative for the euro,” Steven Pearson, a strategist in London at Merrill Lynch & Co., wrote in a note today. Feb. 16 (Bloomberg) -- Palm oil futures dropped in Malaysia as demand diminished after the vegetable oil’s rally last week to a two-week high. April-delivery futures dropped 3.4 percent to 1,928 ringgit ($417) a ton on the Malaysia Derivatives Exchange. Earlier, the contract rose above 2,000 ringgit for the first time since Jan. 7. “I don’t understand why palm oil should rise above 2,000 ringgit” a ton, said Ben Santoso, an analyst with DBS Vickers Securities Singapore. Higher prices may prevent planters from cutting down old palms, which would have reduced supply and kept prices higher, he said. Malaysia’s palm oil exports dropped 13 percent in the first 15 days of this month from the same period in January, Societe Generale de Surveillance, an independent cargo surveyor. A total of 494,172 tons were tracked Feb. 1-15, SGS said today. Palm oil prices have risen 12 percent in the past two weeks on concern smaller soybean crops in Brazil and Argentina, the top exporters of the vegetable oil made from the oilseed, will lower supplies at a time when oil palms in Malaysia and Indonesia are stressed from last year’s record output. Farmers in the U.S., the world’s biggest grower of soybeans, may shift acreage to the oilseed to benefit from the shortfall in South America, likely lowering prices, Santoso said. The U.S. will announce soybean crop estimate next month. Soybean oil for March delivery dropped 0.3 percent last week to 33.3 cents a pound in Chicago. That left it 32 more expensive than palm oil, compared with a six-month average of 58 percent, according to Bloomberg data. The U.S. markets are closed today for a public holiday. FCPO 3rd month April Futures contract plunge RM72 lower to close at RM1922 as compare to previous trading session with 9966 lots traded in the market. CPO price was trader lower in the second trading session. Technically, CPO price seems encounter strong selling pressure around resistance levels at RM2000 regions. However, we still expect CPO price would trade higher in the coming trading session provided if support levels at RM1800 and RM1720 were not violated. Traders were advice to hold long position in the coming trading session while be cautious around the resistance levels at RM1960 and RM2000 regions. FKLI February futures contract closed marginally 1.5 points lower to close 909 as compare to previous trading session with total 3719 lots traded in the market. Heavy profit taking activities in FKLI trading session after manage to surge 32 in the previous trading session. Technically, FKLI was trading within 904 to 906 ranges during trading session but manage to breach 906 and close at 909 levels. We expect FKLI was still riding on a bull rally where strong resistances to be encounter around 914 and 927 region. Traders were advice to hold long position in the coming trading session provided support levels at 900 and 880 were not violated. FKLI February futures contract surge 30 points higher to close 910.5 as compare to previous trading session with total 6701 lots traded in the market. FKLI was traded higher during the entire trading session despite not much movement for regional indices. Technically, FKLI complete the falling wedge formation after break the resistance levels at 888 regions. We expect FKLI would continue to surge higher in the coming trading after mild correction after yesterday strong bust up. Traders were advice to hold long position in the coming trading session while be cautious around the resistance levels at 914 to 927 regions. Supports were seen at 896 and 880 regions. FCPO 3rd month April Futures contract surge RM67 higher to close at RM1995 as compare to previous trading session with 8516 lots traded in the market. CPO price was traded higher during trading session due to strong soybean oil and crude oil electronic trading. Technically, CPO price confirmed falling wedge formation after manage to breach the resistance levels at RM1938 and RM1960 region. We expect CPO price would trade higher in the coming trading session provided if support levels at RM1910 and RM1720 were not violated. Traders were advice to long position in the coming trading session while being cautious around resistance levels at RM2003 and RM2060 regions.